William Stanton DeNike was born on 3/18/09. He was 9lbs 5.5oz and delivered via C-section, since his older brother was delivered that way too. By the time he was 5 days old he showed the same signs of milk protein intolerance (crying after feedings, mucous and blood in his poop) as his brother. We immediately moved him to Neocate formula, the only one that is truly milk protein free. He responded well to the Neocate, it took his mom some time to recover from it. At about 2.5 weeks of age he started to show the signs of having Gastroesophageal Reflux Disease (GERD or reflux), like crying during feedings and spitting up. We started him on Prevacid solutabs (7.5 mg/day). A week later we added Zantac at bedtime to help him settle at night. About a month later we increased his Prevacid dose to 15mg/day (7.5 in the am and pm), because he was have trouble sleeping. At this point he settled into eating (~30oz/day) and sleeping (~8-9 hours at night) well until he was about 4.5 months old. At 4.5 months old he started crying during his feedings. He would burp, then cry, but I could get him to settle down and continue to eat. After a week of doing this he started refusing the bottle completely. He went from eating 30 oz per day to eating 15-18 oz per day. This set off several weeks of doctor’s appointments, tests and procedures at Children’s Hospital. Please see blog posts from August 2009 for more details. After being diagnosed with mild aspiration through a swallow study, we thickened his formula and his eating returned to normal. On August 20, 2009 Will was diagnosed with Ocular Albinism, or a decreased amount of pigment in his eyes. Please see vision pages for more information on this condition. A month later his diagnosis was confirmed by Dr. Avery Weiss at Seattle Children’s Hospital. In the months that followed we saw Dr. Weiss several times. On November 30, 2010 Will had an OCT, Optical Coherence Tomography, test that mapped his retina. Normally OCTs are done on older kids, so we did the best we could. He has an abnormal macula and fovea, but he has both, which is good. They are as good as Jack’s. We will do more of these in the future. Please see this blog post for a recap of his most recent visit to Dr. Weiss. J ackson Edward DeNike was born on January 3, 2005. He was 9lbs 9oz and delivered via C-section after 18 hours of labor. At 1 week old, we started to suspect that Jack had a milk protein intolerance and placed him on “hypoallergenic” formulas available over the counter. During an upper GI we discovered his Gastroesophageal Reflux Disease (GERD or reflux). He was placed on Prevacid. After 4 months of fighting with him to feed, bouncing around to doctors, many tests and different medicines and formulas, we placed a NG tube, a feeding tube in his nose. We attempted to get him eating solids in hopes of removing the tube quickly, but after a bout of the flu we gave up that hope. At 11.5 months he had a G-tube surgically placed in his stomach and was fed that way until he was 2.5 years old. At that time he participated in a 2-week intensive feeding program through Seattle Children’s Hospital (we called it Fun With Food) which jumpstarted his eating. He started the program eating 12% of his calories by mouth and finished eating 70% of his calories by month. Over the next 3 months we gradually weaned him off of his G-tube feedings. A couple of months past his 3rd birthday we removed his G-tube. He threw it in the garbage himself, saying “Bye, bye tube.” Jack has never looked back and now eats more variety that most adults We couldn’t be more proud of him. 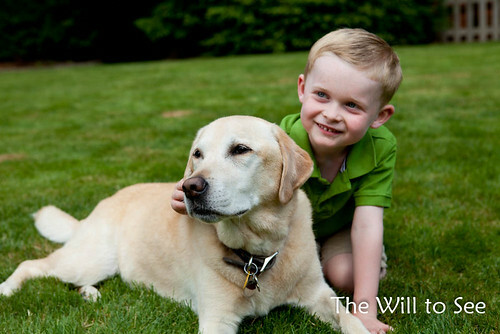 Jack is a wonderful boy who loves his brother Will and his dog Mulligan. He loves to play outside, ride his bike and help Daddy work in the garage. When he gets bigger he would like to drive a Mustang like his PaPa. His favorite color is green and favorite football player is Jake Locker. 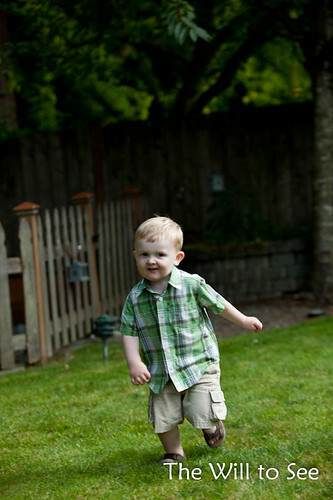 In November 2010, Jack was diagnosed with Ocular Albinism, just like his little brother. An OCT, Optical Coherence Tomography, test confirmed his diagnosis. His vision is 20:25 in his right eye and 20:40 in his left eye. We tried patching Jack’s right eye and special glasses to see if we could strengthen his left eye but did not see much improvement. He doesn’t have good stereoscopic vision (depth perception.) He also has very mild Nystagmus that is only detectable with the OCT machine.